The morning of the 15th dawned bright and clear, and John and I were up at an unreasonably early hour – for us, that is. We were showered, dressed and packed by 8:15, and when I bemoaned the fate of my Valentine’s Day rose (I really didn’t want to leave it behind), John found an empty soda bottle, rinsed it out, filled it with water and voila! instant vase. 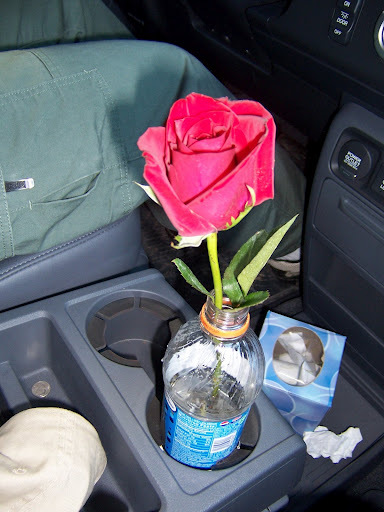 It traveled in the truck’s cup holder with us all day. After checking out, we went to the Avenue Restaurant for breakfast. We’d scoped the place out the night before and decided it looked like a decent enough place. We got there shortly before 9 AM and were seated immediately, as the restaurant was only about half full. That changed within 20 minutes; the place was packed, a wait list had been started and there was a line out the door. The kitchen was a little slow, but we had a good diner-style breakfast, although there were a couple of menu items that gave one pause. After breakfast we drove back over to the Visitors’ Center and parked. We got a place in the closest lot, although we observed that someone had realized the need for additional parking, as the overflow lots were also open. We bought tickets for the movie about Gettysburg (nothing special), which also allowed us to view the new museum and the old Gettysburg Diorama. The Diorama had been moved from its building closer to the battlefield into the new Visitors’ Center, so I assume the Powers That Be at the National Park Service had decided that it, unlike the Electric Map, wasn’t too outdated to save. The Diorama was quite impressive, and the museum, with all its bells and whistles, very interesting – although I kept finding myself missing the sweet simplicity of the Electric Map. We spent better than an hour in the museum, then decided to get a couple of sodas and start touring the battlefield again. A 20-ounce soda in the Center’s snack area was priced at more than three bucks, and I told John I was NOT going to pay that much for a lousy Diet Coke. Instead, we bought our large Diet Cokes at the local McDonald’s and paid for both what we would have paid for a single bottle at the Center. but I can’t remember now what it memor-ialized; probably the left flank of some defending Union line (or the right flank of an attacking Confederate line). It just looked lonesome, out there by itself. 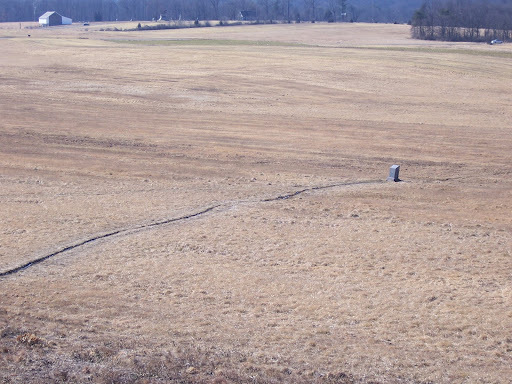 The first day of fighting ended in this area, with the Union troops retreating in a southeasterly direction, through the town of Gettysburg up to Cemetery Hill. 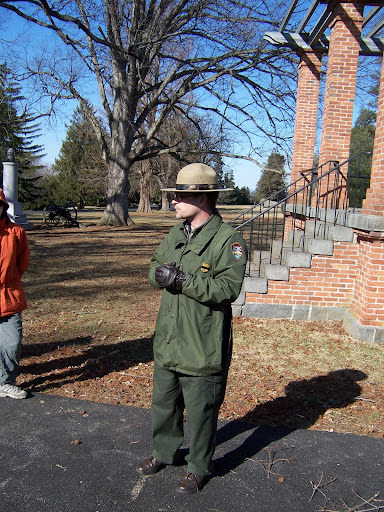 John and I swung up to visit Barlow Knoll, then drove through town to Cemetery Hill to catch an 1 PM “ranger talk” about the Soldiers’ National Cemetery, the site of Lincoln’s Gettysburg Address. About 12:50 we parked in the lot by the old Visitors’ Center, and as we got out of the car, John nodded at a green-coated figure striding past us toward the cemetery gates. “There goes our ranger,” he said. Ranger Campbell gave a dynamic and interesting talk. He told us about the original town cemetery which gave Cemetery Hill its name, and about the dedication of the Soldiers’ National Cemetery right next to it, which occurred several months after the battle and where Lincoln (NOT the featured speaker) gave his famous Address. He moved on to discuss the battle itself, pointing out from this high vantage point the area John and I had just toured (and which was visible through the trees beyond the town). 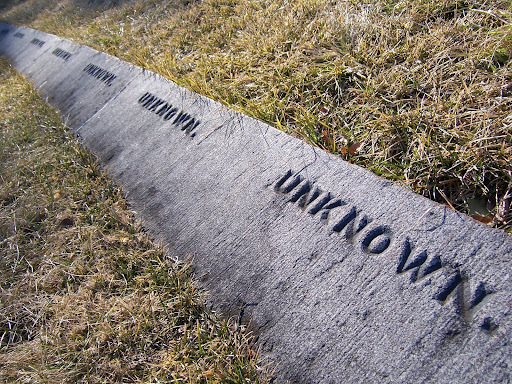 Then he talked about the burial of the Union soldiers, many of whose remains were unidentified, and how the Confederate dead were left in shallow mass graves on the battlefield where they had fallen. He talked about the miseries of the Gettysburg townfolk, left to deal with the wounded, dying and dead in their streets, farms and fields. It was a sobering lecture, and Ranger Campbell was clearly passionate and well-read on his subject. By the time we got back to the car, it was well past lunchtime and we were both hungry and cold. We went back to the Avenue Restaurant on Steinwehr Avenue and had a bite to eat (no, we did NOT have the deep fried pickles), then drove back over to the top of West Confederate Avenue to continue our auto tour. We passed this sign and puzzled over what it could mean (quicksand? big sale on tires? 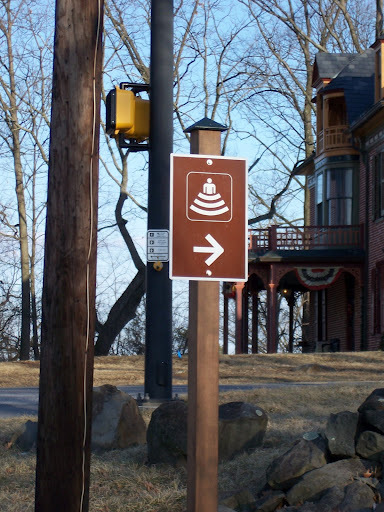 hoopskirts ahead?). We drove through McMillan Woods to the North Carolina Memorial, marking one of the areas where the Confederate Army positioned itself early on the second day of the battle. 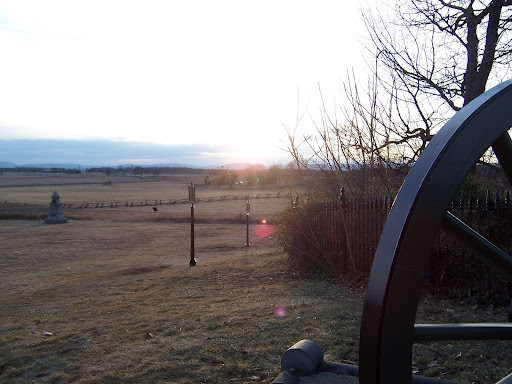 We continued south, coming to the Virginia Memorial and a view to the east of the scene of the final assault of the three-day battle – the infamous and doomed “Pickett’s Charge,” where nearly 12,500 Confederate soldiers advanced for three-quarters of a mile through open fields under heavy Union artillery and rifle fire. More than half the soldiers were killed during the assault, which was ultimately repulsed by the Union. Continuing still further south, we solved the mystery of the odd sign – off to our right was an Ampitheatre. I guess the sign made sense, but only if you knew there was an Ampitheatre in the area. We passed through Pitzer Woods and could see ahead of us the Observation Tower of the first day of our visit. 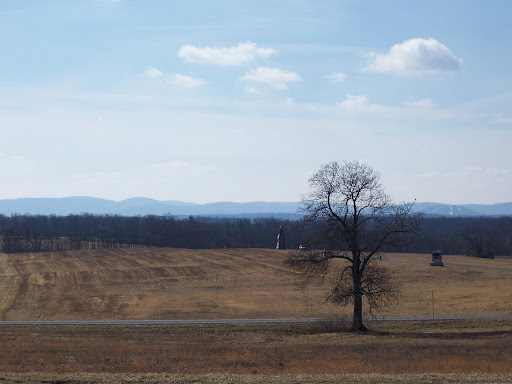 Since we were going back over the previous day’s track, we didn’t stop as we passed by Big Round Top, Little Round Top and the turnoff for Devil’s Den. 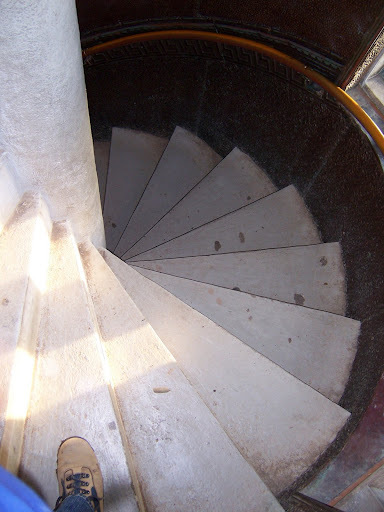 However, we missed our turn for Stops 9, 10 and 11 of the Auto Tour – The Wheatfield, The Peach Orchard and Plum Run. Owing to the layout of the battlefield and the number of one-way roads in the area, the only way we could have doubled back would have been to drive up to Steinwehr Avenue, make a hard left and pick up the Auto Tour again way back near Warfield Ridge. It was getting dark and we still had a couple of places to see, so we regretfully passed on, heading north to the Pennsylvania Memorial. 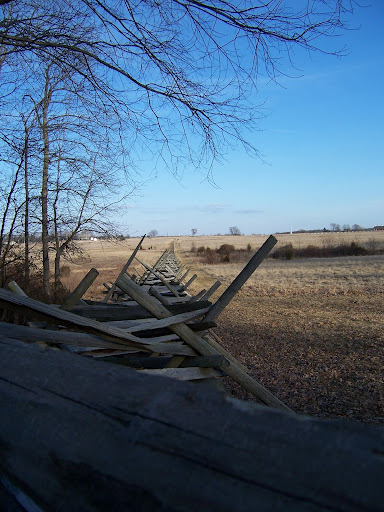 Night was falling rapidly and John very much wanted to visit the East Cavalry Battlefield Site, which is a couple miles east of the main battlefield. Because of that, we made the High Water Mark our final stop. This is as far as the Confederate Army got, both in the battle and in the entire Civil War – the finale of the ill-fated Pickett’s Charge. The following day, the Confederate Army retreated and began its downward spiral toward final defeat two years later. With the fading light, we couldn’t linger; we bypassed Spangler’s Spring and East Cemetery Hill, and drove the few miles east toward the Calvary Battlefield (remarkable mostly for the presence of George Armstrong Custer, who led his Michigan Brigade against General J.E.B. Stuart’s Confederate cavalry). We had a quiet drive through this far-flung portion of the battlefield, then turned the car south again and headed home. Total casualties (killed, wounded and captured) in the three days of fighting at Gettysburg: 23,000 Union soldiers, and as many as 28,000 Confederates. You missed out … fried pickles are nummy! 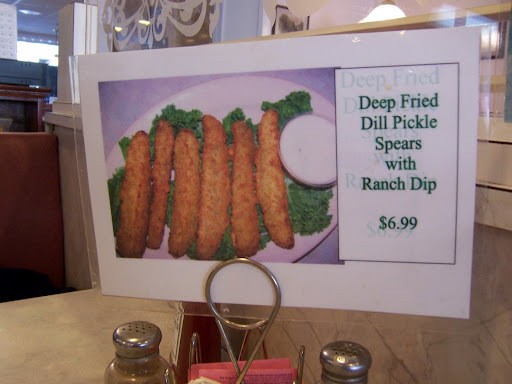 I have to agree – we get fried dill pickles from our local BBQ place and they are quite addictive. Betcha can’t eat just one! March 6, 2009 - 5:17 pm Joan L.
The little sign doesn’t mean amphitheatre, it means dill pickle gas radiating from people who have eaten them deep fried. Actually, a friend got me to try deep fried pickles recently and Julie is right. They are really good.